Where can I find a complete list of allergen, ingredients and information? Where do your raw materials come from? Tomatoes come from Italy, ugly vegetables, dairy products and meat come from Quebec. Do your sauces contain gluten? 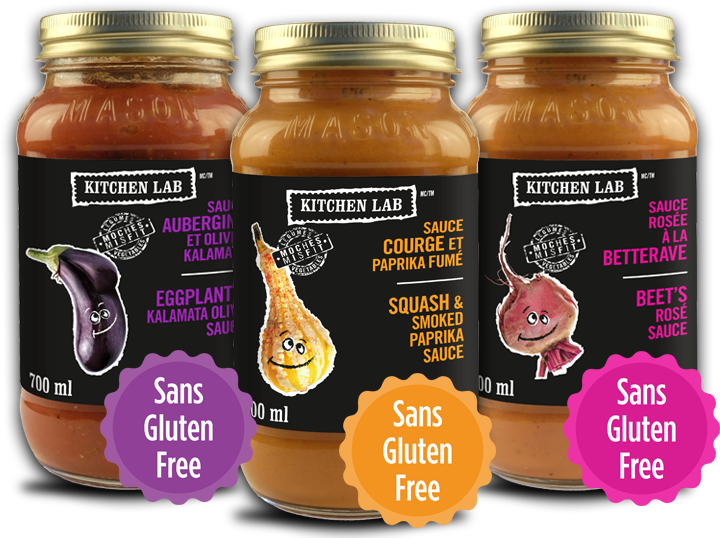 Our sauces are gluten free as indicated on our labels. Do your sauces contain salt and how many calories per serving? Why do your sauces contain cornstarch? We add very little corn starch, but we use it to have a better texture. How long do your sauces stay good for consumption? 2 years after the date of production, you can see the expiry date on the cover of the product. If the lid is curved and the product has not expired, can I consume the product? How to prepare a meal with your sauces? Our sauces are excellent with pasta, lasagna, rice, couscous, quinoa, poultry, meat, fish or seafood. Let your imagination do the work or check out our recipe section. Do you have recipe ideas? In which grocery stores are you selling? Can I return items I bought in store? If the product does not comply with your highest quality standards, you can contact us for a refund to aliments@si-bon.ca . Have the product in your hands, we will have questions to ask you to trace the cause of the problem. Do you sell anywhere other than Quebec? We are currently working on export markets in Ontario and the United States. Can I sell KITCHEN LAB products in my establishment (spa, restaurant, hotel, café)? You can send us an inquiry at aliments@si-bon.ca and we will redirect you to the right person to open an account. Can I offer KITCHEN LAB products in my office for my employees? Can I sell KITCHEN LAB products in my store? Discover our made in Quebec products!